Construction techniques and sewing aids offer the best preventions and cures for fraying satin. If you've ever pulled on a loose thread at the end of a satin ribbon or scrap, you know what can happen to a dress, or anything else, if it begins to fray: total destruction. Whether you're creating a gown, costume or craft project, or if you are dealing with a wardrobe emergency, you can stop satin from fraying. 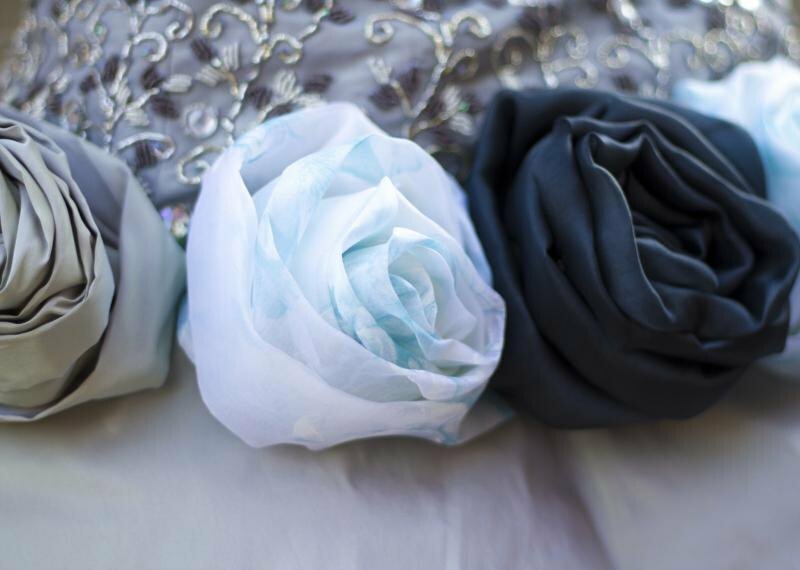 During construction of a garment or craft project, handle the satin as little as possible after you cut it. Fray retardant -- a sewing aid that has a lacquer effect when dry -- can stop fraying in its tracks. It can cause staining, though, so use it with caution. Fray retardant stops fraying on the ends of satin ribbons, on cut edges of fabric and on clothing that's already sewn. For best results, apply the narrowest bead of the product as possible. For fine work, such as a cut ribbon end or a strained seam, apply fray retardant with a toothpick for full control. Pinking shears, those odd-looking scissors that create points in fabric, are satin's friend. Aside from being reminiscent of the fun of kids' crafts, the directional cuts created by the pinking shears protect satin's vulnerable edges. As opposed to a straight cut that can fray to the point of creating a silky fringe and possible wardrobe malfunction, the cut from pinking shears provides an edge that resists raveling. It's an inexpensive fix that doesn't take longer than cutting with regular scissors. If you've constructed a satin lining or garment, use pinking shears to cut up to 1/8 inch off the seam allowances to stop fraying. Prevention is worth a pound of cure. If you're just starting a project in satin, invest in a quality fabric. Formal wear often uses slipper satin; when you see a glossy wedding dress that drapes like a dream, that's slipper satin. This fabric's high thread count improves its durability and reduces the risk of splitting. Avoid seams on the straight; instead cut along the weave of the fabric. Bias cut satin flows and drapes well and the bias cut results in less vulnerable seams. Finishing seam edges and hems offers a crucial defense against raveling. Methods that work best on satin include pinking, zigzag stitching and serging with a security stitch. Using bias binding also helps to prevent fraying. Lace seam tape is flexible and moves well with lightweight fabrics such as crepe-back satin for hemming unlined garments. Lining a satin garment or accessory can substitute for seam finishing. For example, with a lining you don't need to do additional stitching to finish a hem on a satin skirt. For a form-fitting garment, it's best to finish the seams whether it's lined or not.